OCAD U uses TechSmith Relay for Lecture Capture. The recording software can be downloaded and used anywhere. TechSmith Relay is integrated with Canvas so that sharing videos with students is easy. Get a quick overview of the TechSmith Relay Recorder by watching this video. To get started with the TechSmith Relay Recorder, look for the Record button in the TechSmith Relay website, or in Canvas. The first time you attempt to launch the recorder, you'll be prompted to download the application to the local machine. 1. Screen area selection: Choose to record a region of the screen or fullscreen. If you chose Region as your screen area, yellow crosshairs will appear. Use the crosshairs to drag out a specific recording region on your screen. Also, if you choose Region as your screen area, you'll see a small Fullscreen button near the top of your screen. Clicking this button will select your entire screen. 2. 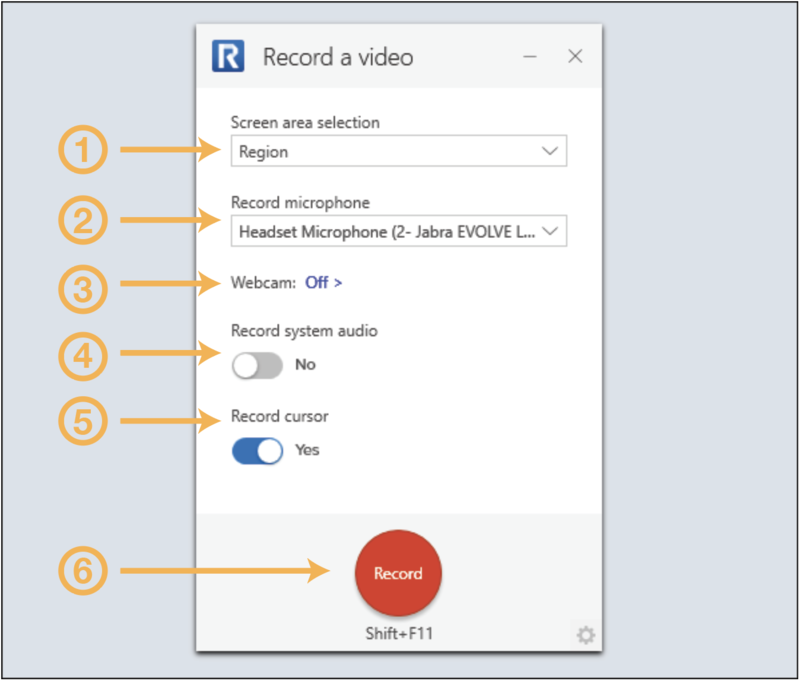 Record microphone: Choose an available microphone from your list of available devices. 3. Webcam: Click to enable the webcam (optional). You can record a webcam-only video, or toggle back and forth between webcam and screen content during recording. 4. Record system audio: Enable this switch to record the audio that you hear playing back on your computer. Note that you can record both system audio and narration from a single microphone at the same time. 5. Record cursor: Disable this switch to hide the cursor in the recording. 6. Record: Click this to begin your session. Please note: clicking the Record button here changes the interface but does not start recording, click the Record button found at the bottom of the screen as shown in the next image. When Record is pressed, the recording controls appear at the bottom of the screen. 1. Record button. When recording, this button becomes the Stop button. When recording a Pause button will also appear to the right of this button. This button also resumes recording from a paused state. 4. The current dimensions of the recording window.